All the latest Kelser news, media appearances, event recaps, press releases, and articles covering topics such as cybersecurity, business continuity, disaster recovery, networking and managed services, in one convenient place. Kelser was in news outlets across the world this spring when the Associated Press quoted CEO Barry Kelly in an article titled “6 things small businesses can do to improve cybersecurity” which ran in the New York Times, Washington Post, ABC News, Daily Mail, Fox Business, and many more. When the news emerged that there was a security issue in Google Chrome, Kelser provided NBC Connecticut with some expert perspective. 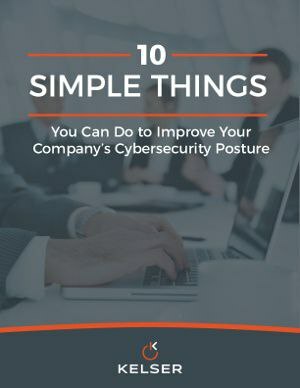 Start improving your cybersecurity posture now with this ebook, free when you subscribe to our blog. It seems like large-scale data breaches that expose thousands upon millions of records are regrettably becoming commonplace today. Protecting your personal and business data should be a priority for anyone that has ever entered information into a web form. Without taking proper steps to secure your data like login credentials, you could make yourself vulnerable to anything from phishing attacks to full account takeover (or even worse). Even a single breach can cost a business upwards of $2.3 million per attack (not to mention the costs related to things like the damage to your reputation) and personal accounts risk losing personal finances, priceless memories (like photos and videos), and more. One of the most basic ways to improve cybersecurity is to make sure you're following best practices for your passwords. By now, you’ve probably heard about the Starwood Hotel breach. In November, Marriott, the world’s largest hotel chain, confirmed that as many as 500 million people who made reservations at one of its Starwood properties could have had their personal information—including names, mailing addresses, phone numbers, dates of birth, passport and credit card info—stolen by Chinese hackers. Peter Aiken, associate professor of information systems at the Virginia Commonwealth University School of Business, calls the attack “the biggest threat to U.S. national security that we have ever faced” from a data breach. At the recent TEDxHartford event, Kelser Vice President of Professional Services Matt Kozloski spoke about cybersecurity. His goal -- and our goal as a Cybersecurity-as-a-Service provider -- is to change the way the we think about cybersecurity, so that it becomes part of our habits. Watch the video and enjoy some choice quotes below. NEW BRITAIN, Conn. – Last month, Hospital for Special Care (HSC) kicked off its new Center for Cognitive Health with a reception at the hospital's New Britain campus. Kelser Corporation presented a check for $25,500 to support the new initiative raised at the 2018 Kelser Charity Challenge golf tournament held in September. It can be scary out there in the digital world. It seems like not a week goes by where we don’t hear about phishing emails, unpatched vulnerabilities, or the latest strain of ransomware exposing the data of millions of people and businesses to the prying eyes of malicious actors. Every person and every business are potential targets with some of the largest companies in the world susceptible to the same vulnerabilities as the average Joe at their home computer (phishing being a prime example). But all is not lost as October is National Cybersecurity Awareness Month! What better time to review your cybersecurity practices, discover where you can make improvements, and seize the chance to make positive change? Consider it a fall “spring cleaning” for your digital life and business.